Actor turned producer, #ChitrangdaSingh adds another feather in her cap, now she will be seen hosting a cooking show on television. The actress has been roped in by English GEC channel, AXN, to be a part of a unique food-based show scheduled to air next month. 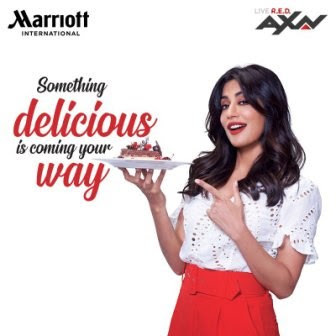 Marriott International, the largest hospitality chain in the world, and AXN India, destination to the best English entertainment shows, have joined hands for a one-of-its-kind association to create a unique culinary show that promises to enthrall viewers. Chitrangda's college degree in food and nutrition and her versatility as an actor, charm, and glamour made her an authentic choice for the show. The association will also be Chitrangda’s first appearance in the English GEC space. On the work front, Chitrangda was last seen in Saheb, Biwi Aur Gangster 3, opposite Sanjay Dutt, Jimmy Shergill, and Mahi Gill. Currently, she is gearing up for Baazaar, which is an upcoming crime film directed by Gauravv K. Chawla, written by Nikkhil Advani, Aseem Arora, and Parveez Sheikh. The film also stars Saif Ali Khan, Rohan Mehra, and Radhika Apte. The film is set in the backdrop of money, power, and business, largely based on the Stock market. The film is scheduled to release on 26 October 2018.